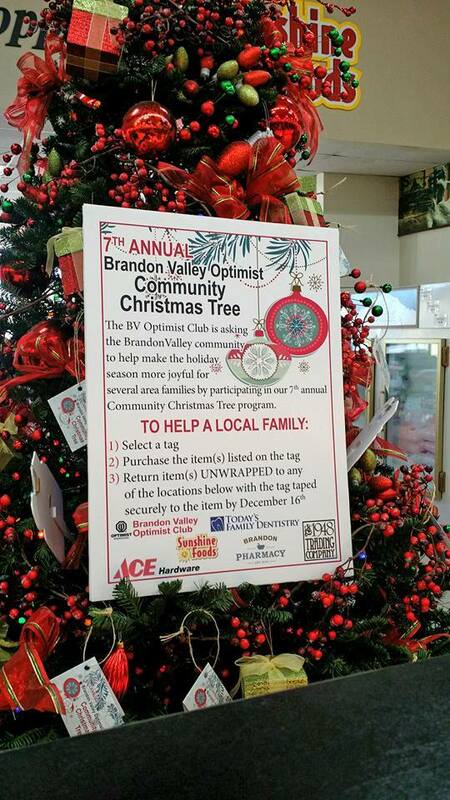 The Community Christmas Tree is a way for the Brandon Valley Optimist Club to assist families in need during the holiday season. Nominated families request gifts that they would like (parents too!). Our volunteers make tags representing those gifts and place them on designated trees in businesses in Brandon. Brandon residents pick the tags they would like, purchase the gifts, and return them under the tree. Our volunteers then collect, organize, wrap, and distribute the gifts to the families. On average, we are able to help 10-15 families per year. In 2017 we were able to provide gifts for 17 local families! Please contact us in October or November if your family or a family you know could benefit or if you are interested in "adopting" a family! for allowing us to use your trees!! !